A one-minute walk from Nippori Station! Unlike capsule hotels, amenities are in your room! Rooms are neat and tidy with access to great hotel facilities! Enjoy tons of nearby shrines, temples and historical sites in Yanesen! Also, Yanaka Ginza is just a minute walk away when you can enjoy shopping at 70 different types of traditional ＆ historical stores! Going anywhere from Nippori Station’s using its 6 train/subway lines! Our hotel accepts advance reservation via telephone. 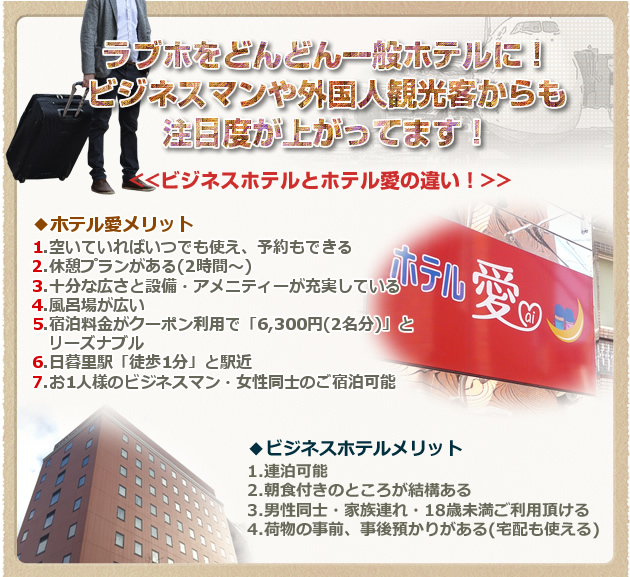 Copyright2006 Hotel 愛 Co., Ltd. All Rights Reserved.